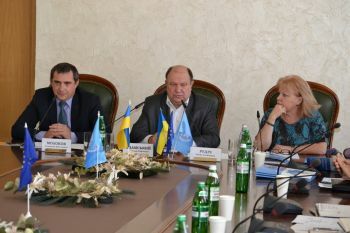 Distinguished attendees included Mr. Yevhen Udod, Head of Oblast Council, Ms. Olena Ruditch, Community Development Specialist of joint EU/UNDP Project “Community Based Approach”, leadership of rayon state administrations and rayon councils; and heads of village and city councils. «Today we have completed the second phase of the project on a high level and can move on to the third phase. 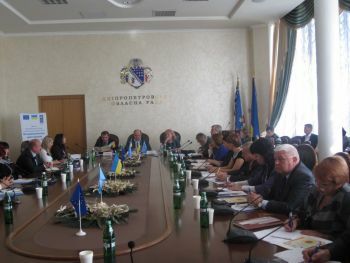 During the project implementation, community members of Dnipropetrovsk actively participated in its implementation. It clearly shows that people care about the place where they live, and they are jointly involved in its accomplishment. People showed initiative, identified the most urgent problem of its territory, drafted its decision and raised costs for its implementation. Having received additional financial resources provided by the project Oblast Council also shows commitment to fully support proactive community members of the region», underlined in the welcoming speech the Head of Oblast Council Yevhen Udod.